All the searches below are part word or full word searches. * A search for 'tank' will return 'tank' and 'tanker'. * A search for 'ank' will return 'tank', 'tanker' and 'plank'. * A search for '30' will return '60030' and '3000'. ** If you are struggling for a search phrase, a great way to start browsing the database is to use the Year Menu or the Publication Menu, then select the relevant year or catalogue based on your experiences with Tri-ang or Hornby. There you will find what you are looking for. 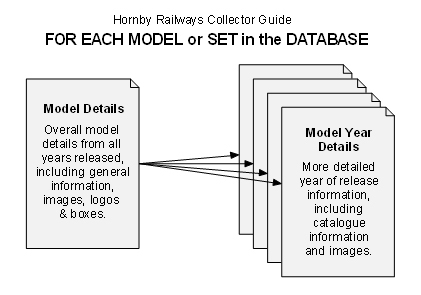 For each model there is one model page (Model Details), we call this the overall model page. 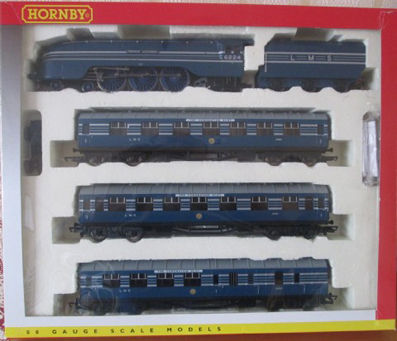 Each model also has one or many model year pages (Model Year Details), one page for each year of release. The pages look quite similar, although at a closer look you will notice many differences. The Model Details page shows most of the information for all the years of release, whereas the Model Year Details page shows all the information around the particular year of release.